Ok, so this isn’t really a fix. It’s more of a work around. First of all you need to obtain devcon.exe. This is basically a command-line Device Manager provided by MS.
Drop devcon in c:\Windows\System32. I chose this directoy only because it’s in the path. 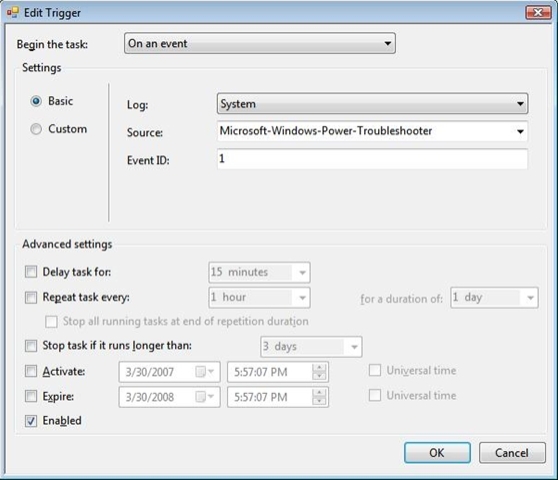 Use Task Scheduler to create a new scheduled task. The trigger for this task should be set as in the following screenshot. The set the “Action” to start the batch file created above. Now, when your tablet is woken from sleep it will run the batch file which disables and then re-enables the Wacom driver. This takes probably 15 seconds so you still can’t use your pen immediately, but it’s much better than having to open the tablet so you can use the keyboard. Thanks for this… I’m pretty pissed off about HP at this issue as I don’t enjoy having my tc4200 turned into an nc4200 as soon as I put it to sleep… grrr. Is there any way we can create a formal petition for this issue to get it fixed? I wish. Doubtful that HP would pay any attention.